Ethnic flavors are expected to trend heavily this year, and they won't be the same old enchilada. How many bottles of Gochujang sauce are in your pantry? 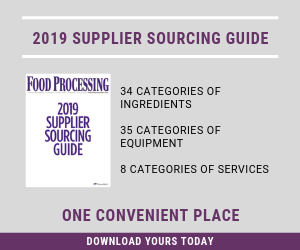 While it may not be the ketchup or even the sriracha sauce of 2015, several food processors and ingredient suppliers are working to introduce the term into the Western lexicon. It's symbolic of the deeper dive American consumers are taking in ethnic foods, looking for more adventure, more spice, more authenticity and specificity in the products they buy. Despite having a breakout 2014, Sriracha sauce is not yet as common in America as ketchup. Nor is it likely to replace ketchup, but Lee Kum Kee is trying. "Consumers are looking for that authentic quality food, not Korean or Asian food with a U.S. spin on taste," says John Han, head of corporate marketing & planning for Korean-based CJ Foods, which is the parent of Annie Chun's. "That's why we're introducing items like Bibigo Gochujang sauce -- a savory and pungent fermented Korean condiment made from red chili, glutinous rice, fermented soybeans and salt, which is used in many traditional Korean dishes." Gochujang spice blend also was part of the Ethnic Inspirations Collection of spices and other ingredients introduced late last year by spice supplier Fuchs North America. The line builds on the traditional elements of several national cuisines while adding some unique twists. "Gochujang is the sauce you want for your wings," reads the headline of one story suggesting party food for Super Bowl Sunday. But at this point, gochujang seems to be exclusively a sauce or spice mix – a quick internet search turned up no gochujang chicken frozen entrees. Which is fine because sauces are an easy way for home cooks to look like a MasterChef. Ethnic foods have been part of Americana since the idea of Americana came about, but over the years ethnic foods have evolved. Today ethnic foods are more pervasive than ever, when you consider that potato chips are as likely to be flavored with smoky chipotle pepper as sour cream and chives. Asian foods in particular are becoming more specialized and more region-specific. "It used to be just Italian and Mexican, but consumer tastes have expanded and now they want not only country specific ethnic foods, but also regional," says Elaine Thai, director of marketing for Lee Kum Kee, City of Industry, Calif. "For example, we have seen increasing demand for Chinese cuisines from not only the Canton and Szechuan regions, but also Beijing and Shanghai." "There is endless debate over just how many culinary styles there are [in Asia]," adds Howard Cantor, corporate research chef at Fuchs North America, Baltimore. "Each of them developed over the centuries as a result of many factors like geography, climate and the social history of the various regions. China alone has at least four or five major styles of cuisine." That Fuchs Ethnic Inspirations Collection is meant to "celebrate the world's rich culinary diversity," the company says. They draw heavily on regional Asian as well as African and Latin American inspirations. In addition to Gochujang Seasoning, the new products are: African Barbecue Marinade, Kashmiri Lamb Seasoning, Mojo Dressing Base, Pho Base, Piri-Piri Chicken Rub, Ramen Soup Base and South American Black Sauce. There's nothing crazy about this cuisine. Foods and flavors from throughout Asia, including India, are hot. In addition to owning Annie Chun's, which has been making Asian foods for American consumers since 1992, CJ Foods also owns the Bibigo brand, a line of Korean dishes based on the company's successful restaurant concept that has locations in Korea, Europe and Southern California. Han agrees that consumer interest in Asian foods has broadened and focused on more specific cuisines. "In the past, Chinese and Japanese were trending," he says. "Now it is Thai, Vietnamese and Korean. Korean food especially has grown in popularity as Korean companies like Samsung and Hyundai have influenced U.S. consumers in terms of creating awareness and interest in Korea. As a result, this has trickled down to interest in other categories, such as Korean food through foodservice and packaged foods as well." Han also notes a built-in advantage of Asian foods. "Asian food is generally very healthy," he says. "Not only in terms of less of bad stuff, but also through the food's nutritional balance and fresh ingredients. So with greater consumer awareness for better-for-you items, our brands have experienced growth." Fermented ingredients are key for attaining rich umami notes and complex flavors, and food processors may go through some trial and error in balancing those flavors, Han says. Fuchs North America describes its new line of ingredients as a starting point from which custom proprietary blends can be created. The company says it is ready to help food formulators find their own distinctive flavors. According to Patrick Laughlin, director of marketing for Fuchs, the process the company uses to develop new seasonings, mixes and flavors involves a good deal of innovation through experimentation. "We're continually focused on evolving consumer taste preferences, but we also experiment with many combinations of flavors," Laughlin notes. "We want to help our food manufacturing customers lead the way when it comes to new taste sensations -- to be distinct, not just like everyone else." Another California company, Day-Lee Foods Santa Fe Springs, Calif., currently is rolling out a line of flavors to extend its Crazy Cuizine portfolio of frozen Asian entrees. The Crazy Cuizine International Favorites line will feature three bold, new flavors, each with a vegetable, rice or noodle component. The first three entrees being launched are Beijing Broccoli Beef (Chinese), Chicken Tikka Masala & Rice (Indian/Southwest Asian) and Garlic Chicken & Noodles (Chinese/Vietnamese). "We've seen an increased demand from consumers for bolder flavors, healthier ingredient profiles, and more high-quality ethnic entrees," said David Weinberg, marketing director at Day-Lee Foods. "These first three deliver well-known Asian entrees kicked up a notch with restaurant quality flavors." With steamed chicken or lightly breaded beef plus lighter sauces, Crazy Cuizine's new International Favorites have a healthier ingredient profiles, the company says. Plans call for expanding beyond traditional Asian foods to include more international and regional cuisines. The new products will be in supermarkets by April, the company says. Falernum -- A sweet syrup with hints of almond, ginger, cloves, lime, vanilla and allspice that is sometimes used in Caribbean drinks. Cascara Tea -- Commonly consumed in Bolivia (where it's it is also called Sultana), the tea is made from the dried berries of the coffee plant and is often mixed with cinnamon. Salted Satsuma -- This Japanese orange varietal gained popularity in New Orleans in recent years. The addition of salt provides a balance of sweet and savory. Maple Mirch (Mirchi) – Hindi for chili pepper, mirch brings spice and heat from India and combines it with maple, a fan favorite in the Western world. The popularity of Indian cuisine is growing as consumers learn the depth and breadth of this particularly rich heritage. African Blue Basil – A perennial basil, this variety is a sterile hybrid of two breeds that yields an unexpected flavor with anise undertones. The other trends are Desert Wildflowers, Smoked Chantilly and "Everything Bagel" Spice Blend. "The 2015 Trends to Taste program centers around one consistent theme: ethnic exploration through flavors," says Teresa Olah, marketing director at Sensient Flavors. "Consumers are seeking adventure in their food and see their choices as an expression of themselves. They are enjoying the ability to sample other cultures through food." Food processors that specialize in ethnic foods face some of the same reformulation challenges as those that produce apple pies or chicken noodle soup: lower sodium, gluten-free, organic and non-GMO offerings. "Lee Kum Kee now has gluten-free and organic soy sauce," Thai points out. "The Lee Kum Kee Panda Brand Ready sauces were also reformulated to remove high-fructose corn syrup and have no artificial flavors and colors." The company continues to see great interest in 2014's juggernaut, Sriracha Chili Sauce, but also in the spread of that taste to Sriracha Mayo and Sriracha Ketchup, she says. Lee Kum Kee also has improved the traditional processing techniques for shrimp paste by drying shrimp in a more hygienic greenhouse instead of constantly exposing them to outdoor conditions. "The shrimp are fermented and dried without adding any preservatives, MSG or artificial coloring so they retain their natural taste," the company says on its website. An end to the embargo could be quite an opportunity for U.S. food and beverage processors. With good reason, many ethnic foods are associated with health-imparting benefits.